The upper catchments of the Snowy River Basin are in south-east NSW. Of the lower catchments, 50 per cent are in north-eastern Victoria. The NSW portion of the catchment area is 9,070 square kilometres. Jindabyne, Bombala, Berridale and Dalgety. 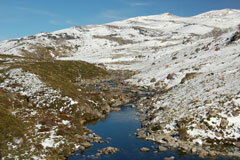 The main tributaries of the Snowy River are the Eucumbene and Thredbo Rivers, which join the river near Jindabyne. Other tributaries include the Mowamba, Maclaughlin, Delegate, Jacobs, Pinch, Deddick, Buchan, Rodger and Brodribb Rivers and Wullwye Creek. The department monitors the condition of river systems in NSW and provides regular updates on water levels, rainfall, water temperature and electrical conductivity. View real-time data from the Snowy on this website. Snowy Mountains Hydro-electric Scheme, local councils, forestry and cattle grazing. The alteration of natural river flows through the construction of dams and weirs, and erosion from land clearing, affect riverine health and contribute to water quality problems such as changes to water temperature. The Snowy Mountains Hydro-electric Scheme captures and stores water from rainfall and snow melts in the Snowy River basin to generate hydro-electric power and provide water for towns and water licence holders, such as irrigators, in the Snowy, Murray and Murrumbidgee regions. The scheme has significantly altered the natural flow of the Snowy River, affecting riverine health and water availability for Snowy landholders and communities. The NSW, Victorian and Australian Governments have agreed on measures to improve the health of the Snowy River. However, consecutive years of drought have reduced the volume of water available for the environment and water licence holders. Sharing water fairly between the environment, towns and water licence holders is a key management issue. The changes to the flow regime associated with regulation of river discharge have resulted in significant declines in the aquatic biodiversity of the Snowy below Jindabyne, and Snowy montane rivers (Upper Snowy, Upper Murray and Upper Murrumbidgee Rivers). Several species living in the Snowy River and Snowy montane rivers have been identified as being of high conservation value, and a few other species, of national environmental significance. In October 2000, the NSW, Victorian and Australian Governments agreed to release environmental flows to the Snowy River in four stages. An environmental flow allocation of 21 per cent Mean Annual Natural Flow was agreed to be released by year 10, following the first flow release which commenced in August 2002. However, these environmental water allocations are dependent on water savings in the Murray-Darling Basin and climatic conditions. To preserve water resources in river and groundwater systems for the long term, it is critical to balance the competing needs of the environment and water users. Water sharing plans establish rules for sharing water between the environmental needs of the river or aquifer, and water users, and also between different types of water use such as town supply, rural domestic supply, stock watering, industry and irrigation. Water sharing plans to cover all catchments in NSW are progressively being developed in consultation with stakeholders and the community.